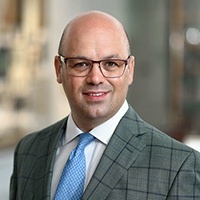 Dr. R. Taylor Ripley is director of the Mesothelioma Treatment Center at Baylor College of Medicine in Houston and an associate professor of surgery. Dr. Robert Taylor Ripley was the hand-picked successor of mesothelioma treatment pioneer Dr. David Sugarbaker, who recruited him for the position before he died in August 2018. Sugarbaker had joined Baylor in 2014 with a goal of creating the finest mesothelioma treatment and research facility in the country. He believed Ripley could finish what he had started. Ripley joined Baylor after four years at the National Cancer Institute, where he carved a reputation for clinical, surgical and investigational research excellence. Contact R. Taylor Ripley M.D. As a cardiothoracic surgeon, Ripley will be doing aggressive, open chest surgeries for pleural mesothelioma and minimally invasive surgical procedures. He will focus on the management of patients with esophageal, thymic, lung and other thoracic malignancies. He sees patients at the Baylor Clinic and performs surgeries at St. Luke’s Medical Center. Ripley also hopes to grow the robotics program, which will expand the reach of thoracic surgery capabilities at Baylor. “Dr. Ripley’s recruitment will add to and expand our expertise, thereby assuring that our patients receive unparalleled care,” said Dr. Kent Osborne, director of the Comprehensive Cancer Center at Baylor. Ripley will oversee his novel laboratory work that began at the NCI with cell biology and tumor metabolism, involving the reprograming of cells to make them more vulnerable to therapy. That research is part of a program Sugarbaker had wanted to build, which lead to him recruiting Ripley. Ripley earned his medical degree from Vanderbilt University. He did his surgical training at the Memorial Sloan Kettering Cancer Center in New York, the University of Pittsburgh Medical Center and the University of Colorado in Denver. At MSK, he worked closely with Dr. Valerie Rusch, a mesothelioma specialist who sparked his interest in this rare cancer. Ripley also has a strong interest in advancing the treatment of esophageal cancer and lung cancer, studying environmental stimuli that promote treatment resistance and tumor growth. He works to develop the patient-doctor relationships that go well beyond the clinical and surgical platforms. He believes in the personalization of care and a lifelong commitment to each patient. He also believes strongly in educating patients as thoroughly as possible about the disease they have, and the treatments they select. He encourages questions from families and patients. Disclaimer: Dr. R. Taylor Ripley has no professional affiliation with Asbestos.com.